A building is so much more than the sum of its parts. Green building recognizes that to create a building where all of the systems work together to optimize performance, the whole development team has to work together from start to finish. An integrated design process brings the full team: owners, developers, architects, engineers, builders, subcontractors, consultants, operations staff, and, when appropriate, government representatives and residents, to the table to choose the right package of methods and technologies to create a truly high-performance building. This collaboration and coordination throughout the project save time and money by sharing knowledge and reducing call-backs. Integrated design is the key to bringing the costs of a green project in line with a business-as-usual budget. Because integrated design is essential to realizing the goals of green affordable housing and to reigning in the costs, an integrated approach should be at the center of green building policy. Requiring or incentivizing individual green building technologies, products, or methods cannot take the place of strong support for integrated design. Innovative techniques and green alternatives can become beneficial add-ons, with corresponding added cost; however, when these techniques and features are built into the building's design from day one, they yield even better results and can pay for themselves. For example, when architects orient windows to take advantage of the wind and sun, heating and cooling loads decrease. Combined with high-performance windows and alternative framing techniques that allow builders to install more insulation, a developer can save money up front by buying smaller HVAC equipment and devoting less space to ductwork. Work to make the governmental review and permitting process encourage, not impede, an integrated approach. Offer a comprehensive permitting process that involves all of the relevant agencies. This will encourage the developer to address the whole building, not one element at a time. Also pull in funding agencies, which may have different green building requirements. 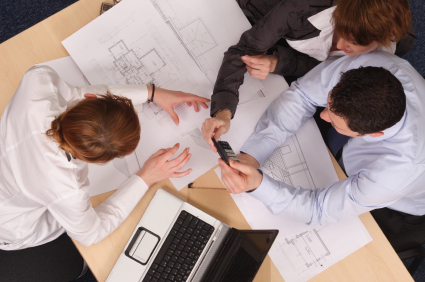 Allow the integrated design charrette to satisfy certain review requirements. Create a single reporting mechanism to translate charrette objectives into action items that can be monitored throughout design and construction. Encourage the developer to hold an early-stage design meeting with the owner, architect, builder, construction manager, engineers, landscape architect, finance partners, green consultant, development consultant, and building operations staff. Offer to help find a charrette facilitator and/or green design consultant. Compile and circulate a list of facilitators, perhaps in conjunction with issuance of an RFP for public funding. Ask developers to meet with their full team to set goals and a desired "level of green" early on. Consider requesting a charrette report detailing a commitment to green. Request follow-up reports from subsequent development team meetings at key project junctures such as construction document review. Evaluate each proposed green alternative in relation to the whole building and choose the best set of options for your project. Up-front analysis allows for strong targets for energy efficiency and environmental performance. Take integrated design to the community level with these green infrastructure approaches from the Playbook for Green Buildings + Neighborhoods.